Think, change and help the environment! Não fala Inglês? Percebe Português? If not us to be concerned about the future of "our house" who? On this blog will find information on what each can and should do to save our Planeta.Conto with your comments, suggestions and complaints to help building this blog and publishes it as possible. 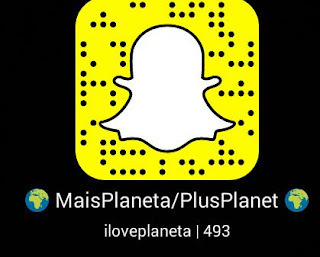 You can add us use our snapcode (picture) or using the username (iloveplaneta). Follow us and accompanies us. The Nile River is the main river that runs Egypt, Uganda and Sudan. The second largest river in the world with 6650 km in length, is born in Lake Victoria in Uganda (the second largest lake of freshwater in the world and the largest Africa), and flows in the form of delta on the Mediterranean Sea where deposits 2,700 cubic meters of water per second. Called "Iteru" or "great river" by the ancient Egyptians who owe him the development of their civilization, the Nile is currently a source of energy through hydroelectric plant of Aswan (or Aswan). It is divided into two parts in Egypt that are extremely fertile due to the presence of organic kill periodically deposited by river floods: a region known as the "Nile Valley", consisting of about 15 km on both sides throughout the its extension into Egyptian territory, and the "Nile Delta" region where it flows into the sea and where it divides into several effluents and the two main ones are the Rosetta and Damietta, with a total length of 9,600 km² of fertile area. The basin of the Nile is very extensive occupies a 3,349,000 sq km area. In its path it receives various names, when leaving Lake Victoria is called the Victoria Nile and then to go through Lake Albert is called Nile Alberto until you reach a region in Sudan where it receives the name of Al-Jabal ( the mountainous). ALL SUBJECTS COVERED IN THIS BLOG! How to make a happy animal? The major rivers of the Iberian Peninsula! PlusPlanet. Tema Janela desenhada. Imagens de temas por epicurean. Com tecnologia do Blogger.